You call this swill fiction? 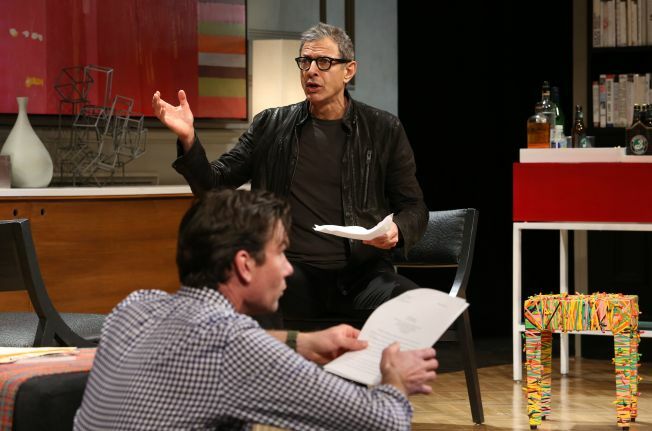 Jeff Goldblum rips into student Jerry O'Connell in "Seminar" at the Golden Theatre. In Broadway’s “Seminar,” four aspiring novelists sign up for a pricey private writing class with Leonard, an international literary figure whose career imploded after a plagiarism scandal. Joining Goldblum at the Golden Theatre are two other new additions: Justin Long, in his Broadway debut, and Zoe Lister-Jones (“The Little Dog Laughed”). Jerry O’Connell and Hetienne Park remain from the original cast. The 90-minute comedy was written by Theresa Rebeck, creator of NBC’s “Smash.” Goldblum spoke with WNBC by phone from his Tribeca rental. GOLDBLUM: I have no plans to yet, but I had a great time there. It always surprises me, people of all different ages come up and say: “Oh my God! It’s Rachel’s dad!” (Lea Michele) is so fantastic. Boy, was she nice to me, and she's a very special talent. So beautiful. ... I’d been a fan of Brian Stokes-Mitchell and I loved every minute we spent together. We went to the Capitol Records building and recorded an extended version of Cole Porter’s “You’re the Top.” We did that little snippet of it on the show, but we recorded an extended version for the "Glee" site. NBC4NY: Rachel’s dads are nice. Leonard, in “Seminar”? Not so much. What’s the cruelest comment you make to one of your students? NBC4NY: And yet, you argue that he’s really an excellent instructor, as written. GOLDBLUM: I think he’s a complicated teacher, but he’s very effective. He helps Kate blossom and find a voice; he helps Douglas identify who he is for himself. It’s painful and possibly confusing for them, early on. I tear off Band-Aids, and burn away their egos and provincial sensibilities very quickly, as painful as that may be. But I’m direct and straight. NBC4NY: When you’re not acting, you teach acting, in L.A. I assume you’re nothing like Leonard? GOLDBLUM: I don’t enjoy being mean or hurtful -- although, remember, we can deconstruct everything Leonard’s doing and say it’s also effective. I’m passionate, but I don’t as easily or quickly resort to the sharp knife. I think Leonard has this very freewheeling classroom technique that’s maybe influenced by his 1970s, who-knows-what method style: “Let’s get down to our psychological underwear with each other and be authentic, and then hopefully it will impact our creative lives.” I have a more conventional line that defines the teacher-student relationship. NBC4NY: Your predecessor, Alan Rickman, owned this role. How has the experience been of following him? GOLDBLUM: Well, he did it as a British fellow. I don’t. (Laughs.) I’ve started to feel like I might be diverging a little in the idea of our backstory. Instead of finding myself with a backstory that had led me to a place of self-loathing, I’m coming around to this idea that my Leonard has already had a kind of redemption ... the teaching has already delivered me to this place of robust presence and supreme aliveness. NBC4NY: Did you have a mentor who recognized your talent? GOLDBLUM: My life has been transformed by great teachers all the way, not only with acting, but piano, voice and dance. Sandy Meisner was at the Neighborhood Playhouse when I first went there. He found his own forays into acting kind of infantile-making, having to put his best foot forward. But, when he used his talents to help others, he thought it was a healthy thing. And I know what he’s talking about. It feels very delicious to teach.